Mt. 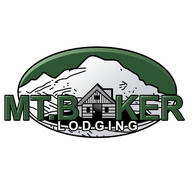 Baker Lodging - Cabin #67 - A very private 2-story cabin with a private outdoor hot tub! This great little 2-story, 3-bedroom, 1-bath cabin may be just what the doctor ordered! The 1st floor includes a cozy living/dining area with a gas fireplace, a VCR-DVD/monitor, a full kitchen, 1-full bath, and a laundry cubby with washer/dryer. The 2nd floor features one bedroom with 1-full bed, a 2nd bedroom with 1-full bed and a 3rd bedroom with 1-twin bed. Outside, there is a gazebo covered gas grill/picnic area, a private outdoor HOT TUB, and a deck leading to a walking trail down to Silver Lake! This pet-friendly vacation property will sleep up to 5-persons. (ENFORCED Maximum Occupancy!). Minimum stay: 3 day | Maximum stay: 30 day Duration error: please change your dates.